Today is the first true taste of summer that we are having here in Maine. The sun is shining, the air temperature is 85F, and everywhere you look there are pale legs wearing shorts for the first time this year. 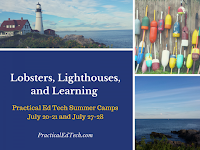 All this has me thinking about all of the fun things that you can do around Portland, Maine before and after the Practical Ed Tech Summer Camps. Discounted registration is available for just 12 more days. 1. Take a sunset cruise around Casco Bay. Casco Bay Lines offers day and evening cruises to see the islands and forts dotting Casco Bay. The cruises depart just a few blocks from the host hotel. 2. Try your hand at lobstering. Summer lobstering is nothing like Deadliest Catch. Lucky Catch Cruises will let you experience the process of catching a lobster in Maine. You'll see a nice part of Casco Bay too. 3. Eat a lobster. A summer trip to coastal Maine is not complete without enjoying lobster. From hole-in-the-wall lobster roll stands to 5 star restaurants, there is no shortage of great places to enjoy the quintessential Maine meal. 4. Bike or walk the Eastern Trail. The trail starts at Bug Light lighthouse and runs south to Kennebunk. You can start or stop almost anywhere in between the two ends of the trail. 5. After you enjoy the Eastern Trail, take a tour of one of many microbreweries in Portland. Portland, Maine has the highest number of breweries per capita of any city in the United States. I'm fond of Allagash and Bissell Brothers. 6. Maine Children's Museum offers great learning opportunities for toddlers, tweens, and teens. 7. The Portland Museum of Art is across the street from the host hotel. Admission is free on Friday evenings so head over after the Chromebook Camp or BYOD Camp ends. 8. Go see Portland Headlight lighthouse and have a picnic in Fort Williams Park. On a summer day, it's hard to beat laying out a picnic blanket at the park. Or walk the grounds at dusk and enjoy the cool ocean breeze as you smell the sea roses. 9. If you're the shopping type, take a quick ride up to Freeport to see the LL Bean flagship store. Don't forget to get your picture taken by the giant boot or the moose locking horns. 10. Just chill on the beach. There are plenty of public beaches in the area. 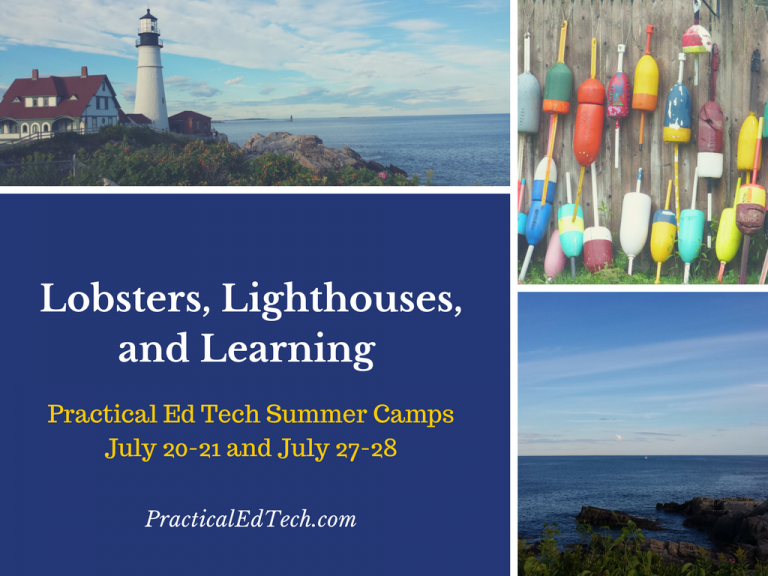 Discounted registration is still available for the Practical Ed Tech Summer Camps happening this July. Unlike a lot of conference settings, Portland, Maine offers the perfect combination of plenty to do without being so busy that you don't want to do anything. I hope you'll join us.